Named in honour of the first structure built on property in 1865, cabin draws inspiration from the picturesque and romantic countryside in the Hills of Headwaters region. The 2,600 square foot space combines rustic and modern décor elements, including reclaimed hardwood floors, wooden beams from an old barn, and a 16-foot steel and glass chandelier. The culinary experience is defined by our farm-to-table philosophy on food. The à-la-carte menu will celebrate the best of local cuisine, using only the freshest ingredients from the Resort’s two-acre fruit and vegetable garden, seasonal preserves, and fare from local farmers and suppliers. Lunch is also served outside (seasonally, May to October) on our Babbo patio. Served in the Cabin restaurant or Babbo Bar during the winter months. Explore the best of the region in our lively lobby lounge and bar. Cocktails, wine, cheese and charcuterie and a small lunch menu await. 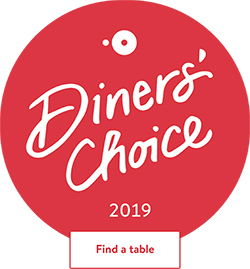 Recipient of the 2010 VQA Restaurant Award of Excellence, our extensive wine list features the best of Canada and the world, with a focus on great Ontario whites from the Niagara and Prince Edward County regions. Scottish Kiss | A cocktail so good it’ll probably ruin you for life. This uniquely-designed space showcases elements of our kitchen and offers guests the opportunity to interact with our chefs and expand their culinary experience. Experience the outdoors through our full glass NanaWall doors onto the Restaurant 85 patio. This dining venue is perfectly laid out for event space. It is a true reflection of our passion for food and commitment to using the finest local and seasonal ingredients. Weddings, anniversaries, baptisms, birthday parties and more – it’s all perfect in Restaurant 85! In our Ski Café, we offer a fresh, delicious and varied menu for you to enjoy – we look forward to serving you! “Our philosophy is that fast food should not have to compromise quality,” emphasizes Chef Mario Turco. This philosophy is heartily put into every fresh-made burger and hot daily special, each order of house-made fries and every vegetarian, gluten free and organic option. 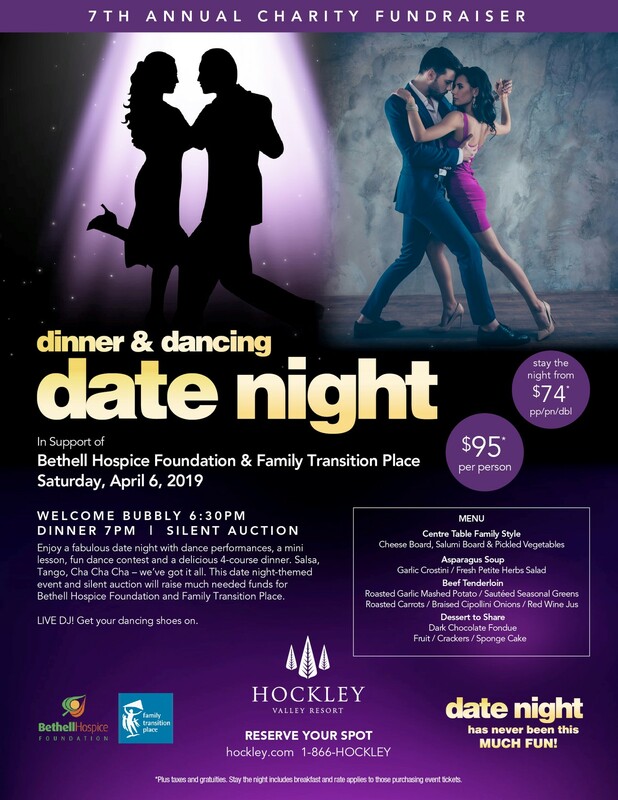 Enjoy a fabulous date night with dance performances, a mini lesson, fun dance contest and a delicious 4-course dinner. Salsa, Tango, Cha Cha Cha – we’ve got it all. This date night-themed event and silent auction will raise much needed funds for Bethell Hospice Foundation and Family Transition Place. LIVE DJ! Get your dancing shoes on. 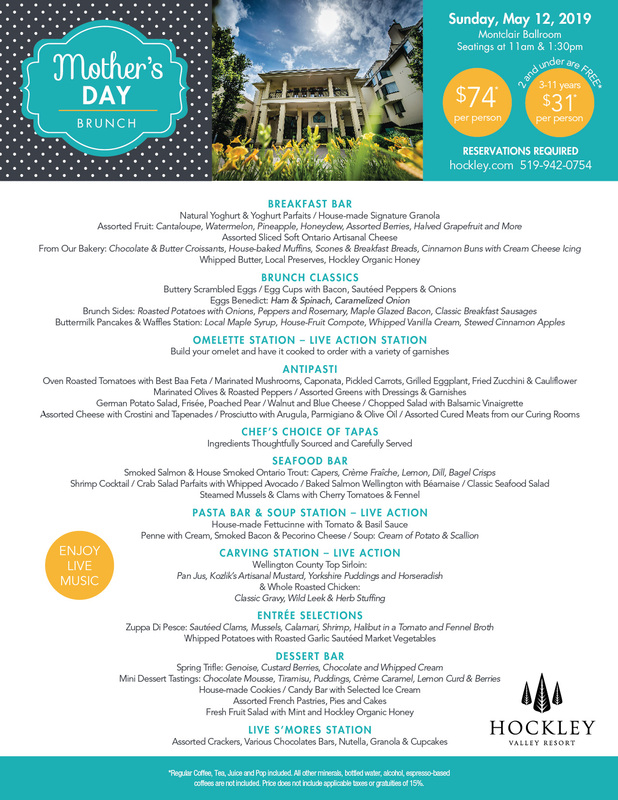 *$95 per person for dinner and dancing. Taxes and gratuities not included and are added at checkout. Stay the Night rate applies to those purchasing event tickets. 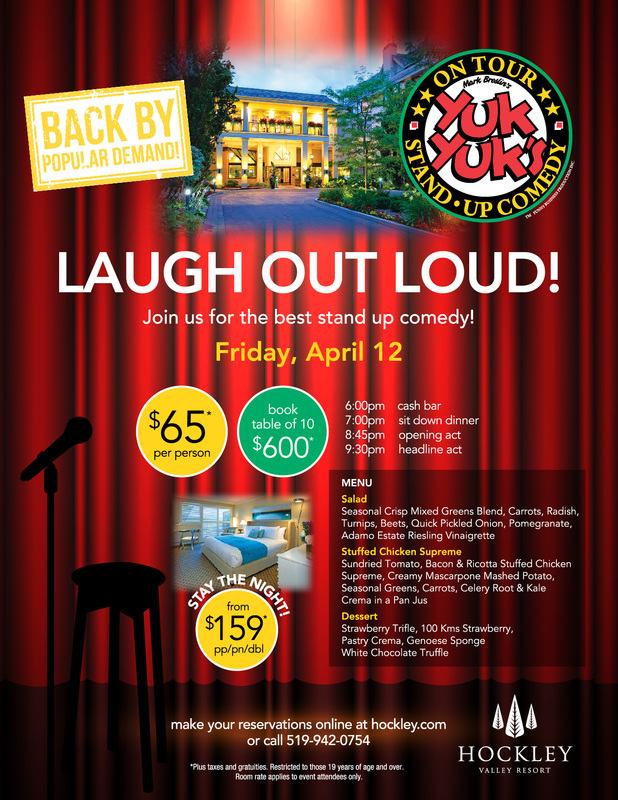 12apr6:00 pm- 11:30 pmYUK YUK'S - BACK BY POPULAR DEMAND! Join us for the best stand up comedy! *Plus taxes and gratuities. Restricted to those 19 years of age and over. Room rate applies to event attendees only. *Regular Coffee, Tea, Juice and Pop included. All other minerals, bottled water, alcohol, espresso-based coffees are not included. Price does not include applicable taxes or gratuities of 15%.